The “Beyond the Guidebook Primer Series” supports implementation of targets and actions listed in Living Water Smart: British Columbia’s Water Plan. The targets and actions establish expectations as to how land will be (re)developed so that stream and watershed health are protected and/or restored. The goal in producing the “Beyond the Guidebook Primer Series” is to facilitate inter-regional collaboration, such that sharing and cross-fertilization of experience and understanding helps all local governments go farther, more efficiently and effectively. The Primer on the Ecological Accounting Process (EAP) – A Methodology for Valuing the ‘Water Balance Services’ Provided by Nature is the seventh in a series of guidance documents that form the basis for knowledge-transfer via the Georgia Basin Inter-Regional Education Initiative (IREI). The foundation document for the series is Stormwater Planning: A Guidebook for British Columbia, released in 2002. The Ecological Accounting Process has the potential to be a catalyst for action by local governments. EAP is one of the twin pillars of Sustainable Watershed Systems, through Asset Management. In contrast to an economic rationale, EAP is underpinned by a simple strategy: approach the problem from a social point of view. What does the community think its ecological assets and services are worth? 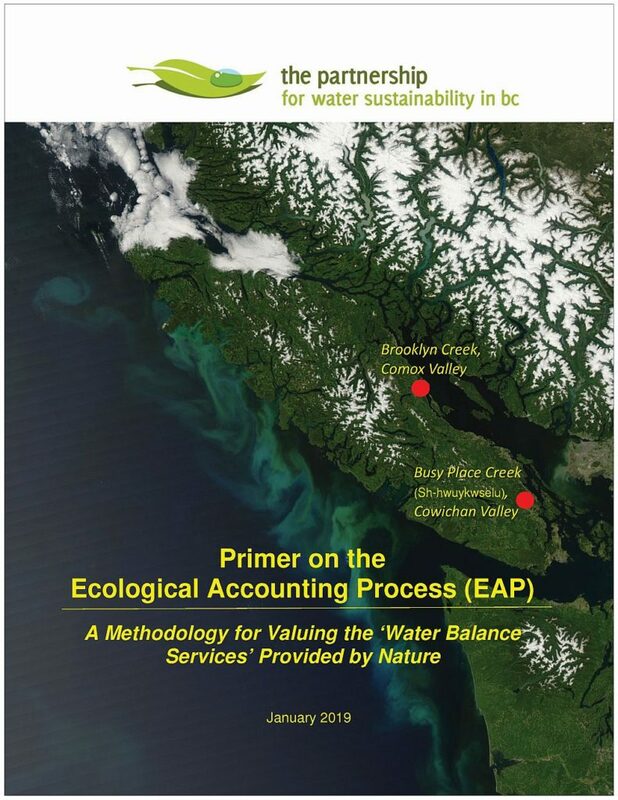 DOWNLOAD: Primer on the Ecological Accounting Process (EAP) – A Methodology for Valuing the ‘Water Balance Services’ Provided by Nature. “The way we have historically developed and drained land has degraded the basic processes of creek hydrology and the dependent ecological services. Simply put, land development practices have disconnected hydrology from ecology. Compounding the situation, communities have for the most part failed to properly address root causes of ‘changes of hydrology’, as well as subsequent impacts of those changes on natural creekshed function,” states Tim Pringle, EAP Chair. “Having a pragmatic methodology for valuing services provided by Mother Nature is key to turning this situation around. To both develop and prove out a methodology, the Partnership for Water Sustainability undertook demonstration applications for two creeksheds on Vancouver Island – one in the Comox Valley and the other in the Cowichan Valley. In this first stage of an eventual 3-stage program, we addressed the question of how do communities decide how much to invest in restoration? “The EAP demonstration application process has been a fruitful journey for the project team and collaborators. Along the way, our collective thinking evolved. Insights and understanding that we gained are shared herein.” continues Tim Pringle. They know that these amenities are part of the community, and that it is worthwhile to invest in managing and maintaining them. “These insights led us to look at creeksheds differently: View choices through the worth lens if one wishes to motivate communities to implement “design with nature” solutions that restore creekshed function. What do we want this place to look like in 50 years? What steps are necessary to make it happen? How do we decide how much to invest in restoration? Download a copy of the Primer on the Ecological Accounting Process (EAP) – A Methodology for Valuing the ‘Water Balance Services’ Provided by Nature.